Pontack’s was a City of London eating house specialising in French cuisine that took its name from owner Pontack. Pontack (his Christian name is apparently unknown) was said by some to have been the son of the president of the Parliament of Bordeaux, Arnaud de Pontac although this claim has been disputed by Brian Cowen, writing in the Oxford Dictionary of National Biography. 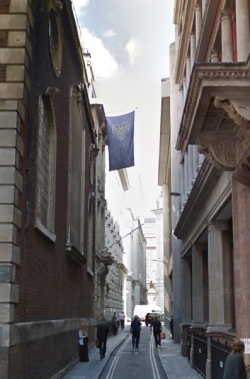 Regardless, Pontack used a portrait of Arnaud as his sign and as a result, the establishment – which he opened on the former site of the White Bear Tavern at 16-17 Lombard Street after the Great Fire of 1666 – was popularly known as “Pontack’s Head”. Arnaud de Pontac owned French vineyards which produced renowned wine and Pontack also capitalised on this connection in selling fine French wines to his clientele. Cowen records that Pontack’s was relocated to the east side of Abchurch Lane in 1688-90 (his old premises were occupied by Edward Lloyd, founder of the famous Lloyd’s Coffee House). The eating house was favourite of the elite, patronised by everyone from Jonathan Swift to Sir Christopher Wren and John Evelyn and was the location of the Royal Society’s annual dinners following its relocation until 1746 (when the society moved the dinners to the Devil Tavern). It’s apparently not known when Pontack died – a date of about 1711 is suggested – but after his death, the establishment was taken over by one Susannah Austin who was married to a Lombard Street banker. It is not known when the establishment ceased trading. PICTURE: Looking northward along Abchurch Lane today (Google Maps).